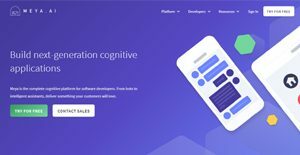 Meya is a bot platform used to create interactive AIs to be deployed within messaging platforms to create personalized and one-of-a-kind customer experiences. With Meya, companies can leverage the power of AI and augment the abilities their customer service agents. This way, they do not need to add more agents to their team. Instead, they can deploy bots that assist agents in providing customer support. Moreover, Meya integrates with numerous applications that extend its usability. This allows organizations to utilize the platform where they need it as well as employ it to gather pertinent customer data, especially with regards to satisfaction levels. With Meya, companies can create bots that offer interactive assistance to their customers inside messaging applications. By adding a bot to their customer service, they do not need to add more agents. Rather, they can leverage AI by passing control between machine and human for a true top-notch service and support. Bots created with Meya can be deployed across numerous messaging channels. But that is not the only integration the platform is capable of. It also works with analytics platforms like Google Analytics to provide insights regarding bot usage and interaction. Plus, it can connect with natural language AIs that process user utterances and provide structured conversational flows for a natural and personal experience. Meya’s Bot Studio is a cloud-based platform where users can design, train, and host their bots. Everything they require to create a smart and interactive bot is in here, such as a code editor, a live debugger, and a visualizer. Meya is not just for a user of one. It supports team collaboration, which is why it enables administrators to provide access to another person. This teammate can then view and make changes to bots. This support for collaboration lets teams work smoothly and efficiently since it is not just a lone individual working on maintaining bots. If you are considering Meya it might also be a good idea to investigate other subcategories of Best Artificial Intelligence Software listed in our database of B2B software reviews. There are well-liked and widely used applications in each software group. But are they necessarily the best fit for your organization’s specific wants? A trendy software solution may have thousands of users, but does it provide what you need? For this reason, do not blindly shell out for popular systems. Read at least a few Meya reviews and think about the factors that you desire in the software such as the fees, main features, available integrations etc. Then, select a few systems that fit your requirements. Check out the free trials of these products, read online comments, get explanations from the maker, and do your investigation meticulously. This exhaustive homework is sure to help you select the best software solution for your company’s special requirements. How Much Does Meya Cost? Contact the vendor to learn more or to request for their enterprise pricing packages. We realize that when you make a decision to buy Artificial Intelligence Software it’s important not only to see how experts evaluate it in their reviews, but also to find out if the real people and companies that buy it are actually satisfied with the product. That’s why we’ve created our behavior-based Customer Satisfaction Algorithm™ that gathers customer reviews, comments and Meya reviews across a wide range of social media sites. The data is then presented in an easy to digest form showing how many people had positive and negative experience with Meya. With that information at hand you should be equipped to make an informed buying decision that you won’t regret. What are Meya pricing details? What integrations are available for Meya? If you need more information about Meya or you simply have a question let us know what you need and we’ll forward your request directly to the vendor.